Steve sims has been scribbling, drawing and illustrating for over ten years. He spends his days working for various entertainment and publishing companies world wide through his post as in house illustrator at Dynamo Ltd in Exeter in the UK. 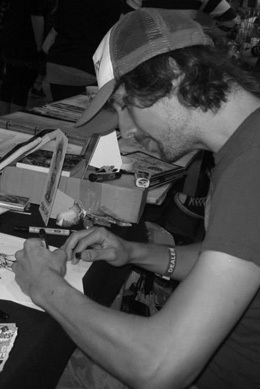 Among other projects he is currently illustrating the best selling "Beast Quest" series, and in his spare time enjoys working on his own comic books and various creative ventures. Steve currently lives in Taunton with his partner Caz.